Set it and forget it... Let iStatus run in the background on your computer or a server on your network and it will let you know when values get beyond thresholds that you configure. 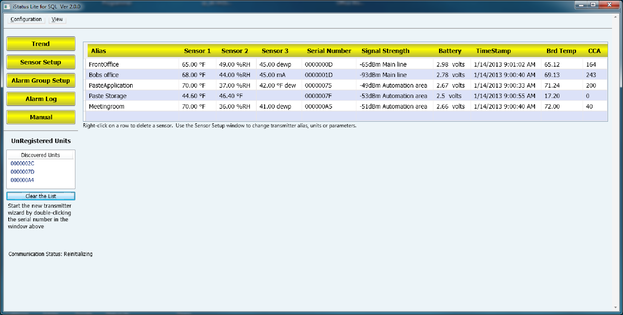 Battery strength and signal strength are monitored and recorded as well. Keep as much data as you need and discard the rest with the database management functions. 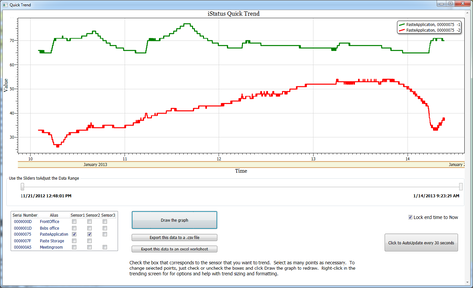 Export plot data to excel or csv file with a click. SQL data can be readily accessed by most reporting and graphics software. iStatus converts incoming measurement values into scaled engineering units and checks each data transmission against user-configured alarm thresholds. New alarms trigger email or text notification. IStatus automatically logs data at user-configured intervals in a SQL database. The user has the option to add custom scaling although most sensors do not need any configuration at all. The iStatus suite of software is comprised of two applications. The receiver service is charged with gathering the data from the receivers, organizing the data, checking for alarms, sending messages, resetting counters and writing data to the database. The receiver software is typically run as a service. The interface application runs separate from the receiver and its job is to allow the user to change settings and view data. Multiple interface applications may run in a network installation.